This is truly one of my faourite lazy day go-tos. After work I am tired and hungry. I want something filling and warm and I want it NOW. Enter my creation; the One Pot Noodle Thing-y. Plus, this dish is one that keeps on giving. You will be thrilled after dinner when you realize that you didn’t destroy the entire kitchen preparing dinner! Combine all ingredients (except for the spinach) in a large pot, cover and bring to a boil. Enjoy the colours, too! Reduce and let simmer for roughly 20 minutes, stirring every few minutes until most of the liquid is reduced and noodle are al dente. Add chopped spinach and cook until wilted, being careful not to overcook. Remove from heat and let sit for 2 minutes with lid. Serve with ample amounts of freshly grated parmesan. This looks great! I am going to try it soon! I have a serious obsession with one pot noodle dishes, but I always lean towards an Asian flavour blend. I’ll have to give this pasta bent a try! 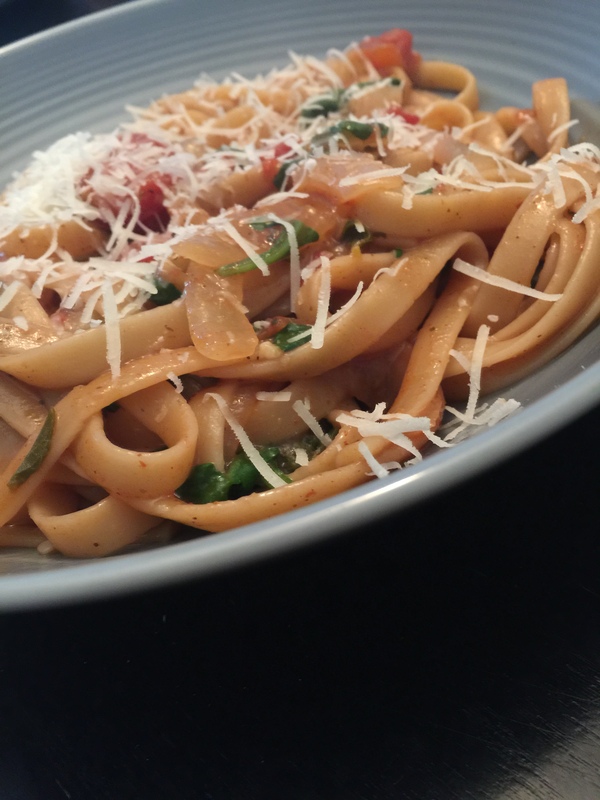 I love a good one pot pasta, they are truly life savers!